As mentioned in a prior post, we were in Louisville for annual physicals and we once again stayed at the house of our friends Dale & Sandy. And since it was cold and snowy, I went into RV search mode when not in a doctor or dentist office. I looked for very specific models in the 2013 - 2017 model year range. 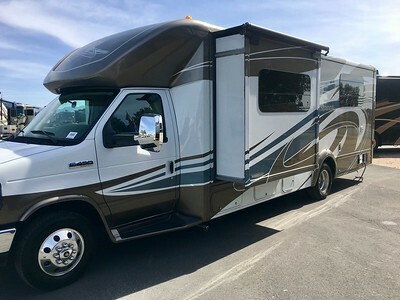 And what I found was the Winnebago Aspects and Itasca Cambrias in the 27K models don't last long when a nice used one comes available. We liked the 27K models over the 30J models because 1) they are a little shorter (also less chance of dragging the rear end), 2) they have a bit more cargo carrying capacity, and 3) because they are smaller, they aren't as easy to overload. and I offered $9,000 below the asking price. It was already a pretty good price, in my opinion, and we settled at halfway in between at $63,500. Of course, it was subject to our in-person inspection .... at LaMesa RV in Tucson. So, on Monday, after getting about three hours of sleep (due to excitement), we took our scheduled flight from Louisville back to Las Vegas. Our truck wasn't ready yet, and I couldn't find a cheap, last-minute flight to Tucson. We considered getting an Uber to Pahrump to get our Jeep, but to save time, we rented a car at the airport and started driving south - a six hour drive. It was on that drive, that we solidified the deal to sell our truck and fifth wheel - the timing couldn't have been better. So, we had a few inquiries on our fifth wheel and truck in the few days after listing it. Some folks wanted more interior pictures, and while we had quite a few, I wanted to take more recent ones and get them posted later this week. However, that's not happening now. After answering a few questions in back-and-forth emails, on Sunday we received an offer from a couple in Iowa that has been following us. They felt they knew our rig well enough to make an offer without seeing it. They weren't in any hurry, but I informed them we may be ready sooner rather than later. So, as Linda drove us out of Las Vegas, I called them to discuss their offer, the logistics, and the timing of delivery. As we drove through the beautiful scenery around Hoover Dam, we finalized a deal. 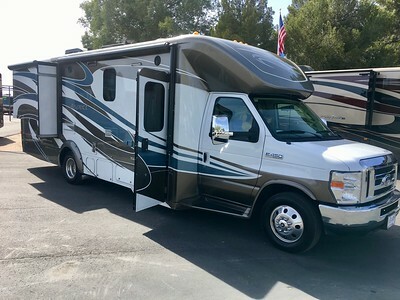 We'll hang around Pahrump for a couple extra weeks after our Spring Rally, and they are going to come to us to close on the sale and pick up the truck and fifth wheel next month. Wow. We enjoyed talking to them and are so happy for them .... and for us. Of course, we're considering it a "pending sale" until it's actually done, but we're pretty confident. After driving a few hours, we were exhausted and got a hotel in Wickenburg, AZ about an hour north of Phoenix. Today, Tuesday, we were on the road before 8:00 a.m. And we arrived at LaMesa a little before 11:00. In the span of 24 hours, we went from temperatures in the 30s and snow to a high of 96 degrees today in Tucson. And because we didn't go back to our fifth wheel in Pahrump, we had no shorts or summer clothes. We were just in time to take part in their free lunch at LaMesa, and then we met with our salesperson, Marti. She took us on a golf cart to the rig, and we gave it a cursory review checking out the exterior and making sure there were no odors or glaring problems inside. Everything looked great. Time for a test drive. It has 26,600 miles which means it was being used consistently by the prior owner. The first thing we noticed was the noise on the rough road by the dealership. Towing a trailer, you never here all the noises inside the coach as you're going down the road. On a smoother road, the rattles weren't so bad but with any stretch that was a bit rough, it was quite annoying. At any rate, Linda will identify the noises and figure out how to muffle them. It was strange to drive something that long, but being used to making very wide turns, I found myself making wider turns than necessary - a good thing. It was quite comfortable and easy to drive. After a short time on the interstate, we exited and Linda took over. She was also quite comfortable driving it, and she took us back to the dealership. That was the worst feeling, but we were already certain we were going to close the deal, so we got our first ding out of the way really fast. In fact, that may have been a record. There is a back-up camera which changes to side cameras when you turn on a turn signal, but the glare on the screen made it pretty useless. Of course, in hindsight, perhaps we should have paid more attention to it ... or I should have gotten out like we always do with the fifth wheel and always instruct others to do. So I take part of the blame for this deflating incident. After getting over our little accident, we plugged in the motorhome (30 amps only), and tried all the appliances. I had a long list of inspection items and we tested just about everything. Then we turned on the 4000-watt generator and it worked well. We were quite pleased with our review. Oh, and the Michelin tires, LT225/75R16, are all late 2017, so that's fantastic. We tell folks buying used RVs to include the cost of new tires in their budgets, but it looks like we'll be able to avoid that expense. The Occupant & Cargo Carrying Capacity (OCCC) is 2800 pounds which isn't too bad. We're planning to weigh it on the way back to Nevada. The wastewater holding tanks are a bit weird. The black tank is in front of the rear axle and drains normally out the 3-inch sewer outlet. But the gray tank is behind the rear axle, and it has a macerator pump that pumps the gray water out of the tank and around the black tank where a pipe connects to the main sewer outlet pipe. If the macerator pump goes out, there is no way to dump the gray tank by gravity without making a modification. After playing around with the motorhome and checking the roof, a couple guys came to get it. They were going to spend the rest of the afternoon detailing the unit and going over it one last time. Then, we'll have a two-hour walk-through in the morning starting at 8:00 a.m. And then we'll head back to Pahrump. Finally, we signed all the paperwork. I wired in a downpayment, and then we signed some loan documents. We're financing so that we can take delivery quickly, and then we knew we would pay it off when our truck and fifth wheel sell. Little did we know that was going to happen so fast. We may have to make one payment before paying it off. Now, we've been telling folks that only a couple of lenders will finance full-timers - Essex Credit and Alliant Credit Union. And full-timers with really good credit will pay about one percentage point higher in interest than non-full-timers. The finance guy, Matthew, indicated that Alliant is much easier to deal with than Essex. Even so, Alliant required us to put one year of insurance premium on deposit with them because we are full-timers. It's a safety net for the lender. That amount sits in an escrow account, and they give it back (with interest) when the loan is paid off. I wasn't happy about that as we had to pay the insurance company and then write a check to Alliant for the same amount. But I'll get over it. Our insurance is with Progressive through Miller Insurance Agency and the annual premium is $1,337. Our claim from last year didn't help, but at least it's less than the total of our truck and fifth wheel premiums. And thus the deal was done. We'll take delivery in the morning. A few days ago, we had absolutely no idea we would actually by a motorhome this fast. With that, we found a hotel near the airport, returned our rental car, and will see if we can get some sleep. Love your plan. Have been following you guys since your post on Niagara Falls. Way to go! Congratulations from Lola and Rush. Be Safe you two. We half way and look to move on next Monday. Have contacted our co-host and hopefully we meet before we get to our Gig. Life Is Good. Once again we can never thank you enough for giving us that push we needed to live this dream. I had to do the same thing with Alliant in April. One good thing is they have a good interest rate on the account. Congrats! Not sure what type of backup monitor it is, but I would think there should be brightness and contrast adjustments that can make it more visible. Re: making wider turns, use caution. 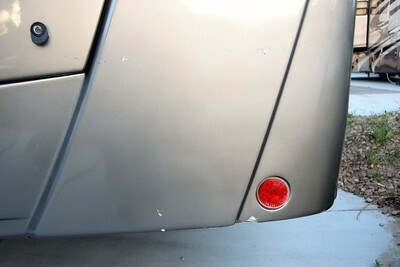 Although you’re on the shorter side, you still have a fair amount of rear end behind the rear wheels. In addition to making sure you don’t catch something on the drivers side, you need to make sure you don’t swing your tail into something on the passenger side. All part of the fun! Good for you; I hope you enjoy the MH as much as we have over the years. We have taken the children and grandchildren on many exciting adventures in our MHs. Yes more noise to contend with but also time to visit with the ones we care about. Best wishes; fare winds and following seas. If you are doing more boondocking are you adding a new solar panel system? It does not seem like you have much roof space open for solar panels. How do you think the smaller black, grey and potable water tanks will effect boondocking?